What if it wasn’t us? So uch of the investment in science, research and technology was spurred on by the Cold War, in particular Sputnik. In Where the Wizards Stay Up Late, Katie Hafner links Sputnik to the funding of ARPA which effectively gave us the internet. 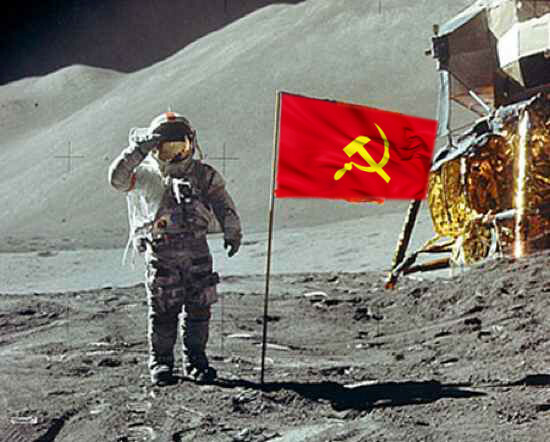 The same year we got a man on the moon, although the latter is controversial 🙂 So, what if the commies got there first? This was a fun assignment because it forced me to play with the perspective tool in Gimp, which was pretty simple and slick. 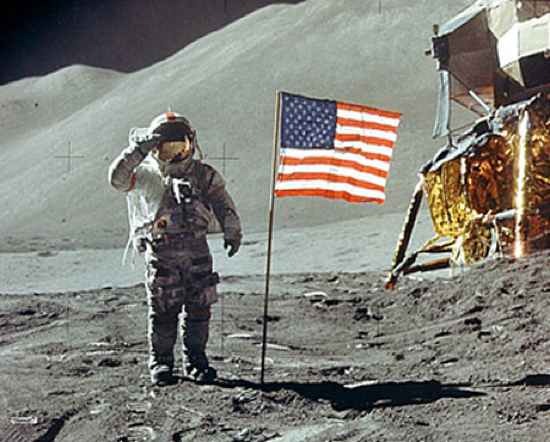 I grabbed an image of the sickle and hammer in Google images that was wind blown, and added it to the Apollo 11 image as a layer and changed the perspective and blurred the edges. It’s not perfect, but enough for the illusion, and it’s good practice for design week! This entry was posted in digital storytelling and tagged ds106, VisualAssignments, VisualAssignments1287, wire106. Bookmark the permalink.